U.S. Population Growth Minority-Driven, But Not in D.C. Overall, racial and ethnic minorities accounted for 91.7% of the nation’s population growth over the past 10 years. The non-Hispanic white population has accounted for only the remaining 8.3% of the nation’s growth. Hispanics were responsible for 56% of the nation’s population growth over the past decade. There are now 50.5 million Latinos living in the U.S. according to the 2010 Census, up from 35.3 million in 2000, making Latinos the nation’s largest minority group and 16.3% of the total population. There are 196.8 million whites in the U.S. (accounting for 63.7% of the total population), 37.7 million blacks (12.2%) and 14.5 million Asians (4.7%). 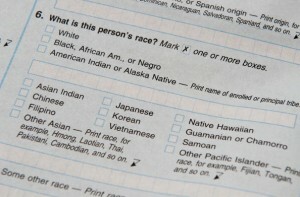 Six million non-Hispanics, or 1.9% of the U.S. population, checked more than one race. That certainly isn’t the case here in D.C., where population growth was driven by non-Hispanic whites. Between 2000 and 2010, the black population declined and the Hispanic population rose from just 7.9 percent of the city’s population 9 percent. But we can look to the surrounding suburban counties to see a more representative picture of what’s happening across the country.